Info on Elvis Fest, Roger Clyne, Billy Bob Thornton &amp; The Boxmasters, Counting Crows, Sarah Shook &amp; The Disarmers, and more. 1. The annual Las Vegas Elvis Festival is happening July 12-15 at Sam's Town. There will 6 great shows and parties each night. Performers include Ryan Pelton, Taylor Rodriguez and Stephi Z, Dean Z, Robert Washington, Ted Torres, Vic Trevino, Jr. and more. There will also be showing of "200 Cadillacs." 2. Roger Clyne with Roger Clyne & The Peacemakers is bring his acoustic act to Cleopatra's Barge inside Caesars Palace on July 13 and 14. Clyne is a singer, songwriter and rhythm guitar player. Trip to Mexico during his younger years were a heavy influence on his music. He also has his own brand of tequila named Roger Clyne's Mexican Moonshine Tequila. 3. "Bigfoot: A Brand New Musical Comedy" tells the story of what happens in the town of Mud Dirt with a 7-foot-tall, hairy menace emerges from the woods. Show times are at 8 p.m. July 13 and 14 and 5 p.m. July 15 at Majestic Reperatory Theatre. 4. "The Lego Batman Movie" will be the featured movie during Dive-In Movie Night on July 13 at Pavilion Pool on Pavilion Center Drive. Cost is $4 per person. Light refreshments available for purchase. 5. The Cornish Pasty Co. on East Charleston Boulevard is hosting The Dark Arts Market on July 13. Local artists will share delightfully creepy crafts and there will be sideshow performers and delicious food and drink. 6. Billy Bob Thornton & The Boxmasters are performing July 13 in the Rocks Lounge at Red Rock hotel-casino. Thornton, who is also an actor, has played in bands since middle school and has released several solo albums. The first Boxmasters album was released in 2008. 7. The Las Vegas Natural History Museum is celebrating its 27th anniversary with free admission and ice cream for kids on July 14. There will also be Permian Monster-themed crafts and activities and special guest critters. 8. Marche Bacchus French Bistro & Wine Shop is celebrating Bastille Day (July 14) with a skydiving show by Vegas Extreme Skydiving, classic French dishes, specialty cocktails, live entertainment, a balloon release and more. 9. Head to House of Blues at Mandalay Bay on July 14 for Local Brews, Local Grooves , a craft beer, food and music festival. Lineup includes Mike Xavier, Silversage, The Revival, Pure Joy People, Glass Pools and Mother Mercury. Unlimited craft beer sampling and delicious food available for purchase. 10. The Gatsby Jazz Band is performing every Saturday night during July at The Underground, which is the speakeasy for The Mob Museum in Downtown Las Vegas. Enjoy delectable Prohibition-era cocktails and sample house-distilled moonshine while enjoying songs from 1920s through 1950s. 11. The Counting Crows are celebrating 25 years and counting this weekend with a performance July 14 inside The Joint at Hard Rock Hotel. Their biggest hits include "Accidentally in Love," "Rain King" and "A Long December." 12. The alt-country rockers Sarah Shook & The Disarmers will shake the Beauty Bar on East Fremont Street with their performance on July 16. The band from North Carolina is known for its unique spur-rattling style. 13. The Third Thursday on 3rd at Downtown Grand will feature a battle between Chrome Gypsy Tattoo and Studio 21. There will be four artists, two canvases, one winner and no do-overs. Music by DJ Edoc, gourmet food trucks and all-you-can-drink beer for just $25. 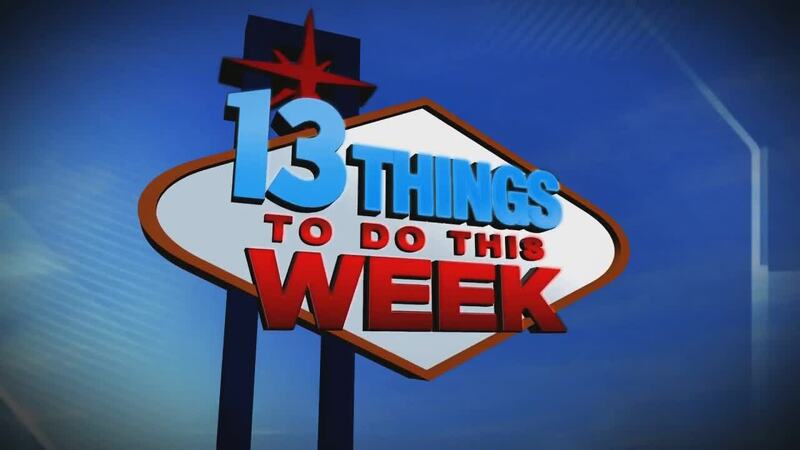 If you would like to submit an item for a future list, send an email with details and photos to joyce.lupiani@ktnv.com.